Red Candy Appples, perfect for a Halloween trick-or-trick bag. They might not be too spooky, although the bright red looks pretty bloody, isn’t it? 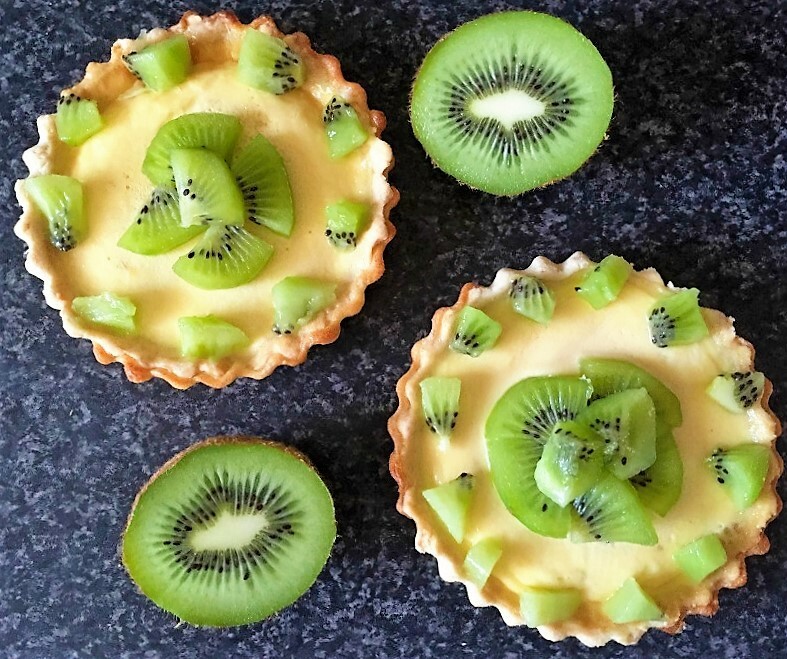 Kids will love them, they look fun and making them is super easy. Halloween may be a Western product, but it has certainly become so popular all over the world. I don’t really dress up myself, but l like the idea of carving pumpkins, decorating the house with scary stuff and so on. After all, it’s all about having fun. And this couldn’t have taken place in any other season than Autumn. Such a colourful season! Don’t you just love it?! 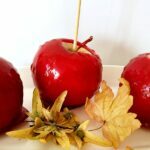 One thing you have to keep in mind when making these candy apples is that you have to act quickly. Once the pan is off the heat, the candy sauce hardens very quickly. If you choose to decorate them with chopped nuts or sugar sprinkles, you’d have to do it as soon as the apples have been coated in candy. 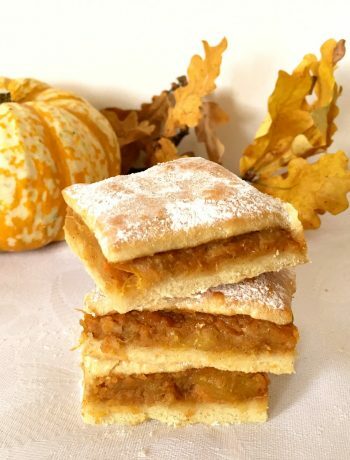 A non-stick baking paper can be a life saver, if you place the coated apples straight on a plate, they will stick to it and you’ll have some hard time trying to remove them off the plate. Red food colouring is optional if you really don’t like the idea of using food colouring, or you can use any other colour you like. 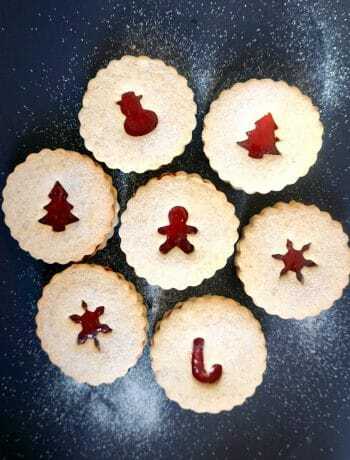 I find that the paste food colouring is the best, a small amount of colour gives a shiny bright red. 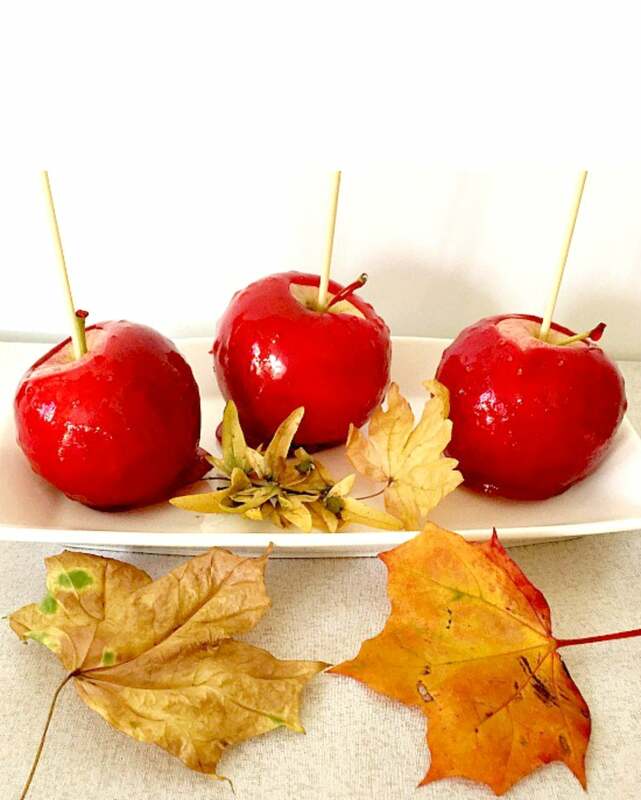 If you don’t have wooden skewers, you can use lollipop holders, chopsticks or anything that helps you hold the apples while you dip them in candy. But that’s pretty much everything, so do give them a try! I might not be a party person, I have only been to one Halloween party so far, and I must say that was more than enough. Not that is was not nice, but in the end everybody was pretty drunk, so not cool at all. Especially since I don’t really drink alcohol. But I do like the idea of carving pumpkins, making candy apples, and breathing in that Halloween atmosphere. 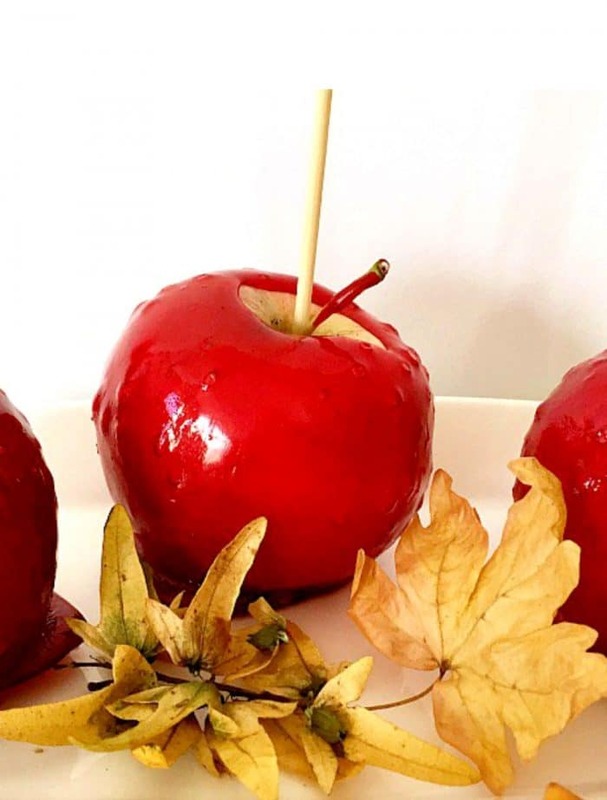 If you’ve tried my RED CANDY APPLES or any other recipe on the blog then don’t forget to rate the recipe and let me know how you got on in the comments below, I love hearing from you! You can also FOLLOW ME on FACEBOOK, and PINTEREST to see more delicious food and what I’m getting up to. Red Candy Apples, perfect for a Halloween trick-or-trick bag. They might not be too spooky, although the bright red looks pretty bloody, isn't it? Kids will love them, they look fun and making them is super easy. Place the sugar, water and vinegar in a saucepan and bring them to a boil over a low heat. Keep an eye on it, as the sugar melts and the mixture thickens pretty quickly. Wash and dry the apples well, then stick wooden skewers down into the apples about halfway through. Once the mixture coats the back of a spatula, add the red food colouring, give it a stir, turn off the heat, then quickly dip the apples, tilting the pan for an even coating. Allow any excess to drip back in the pan. Place the apples on a non-stick baking sheet, you will see that the candy hardens almost straight away.